The problem with statement sleeves is that they’re not very practical. Sure, they may look just fabulous, but it’s hardly worth the trouble. I mean, they complicate your life in ways you never could have anticipated. For instance, if they’re long and / or wide, they tend to get caught on door handles. Or is this something that only happens to me? These sleeves are a bit shorter, so that shouldn’t be a problem. But where can I find a coat with sleeves wide enough to accommodate them?!? How do you feel about statement sleeves? 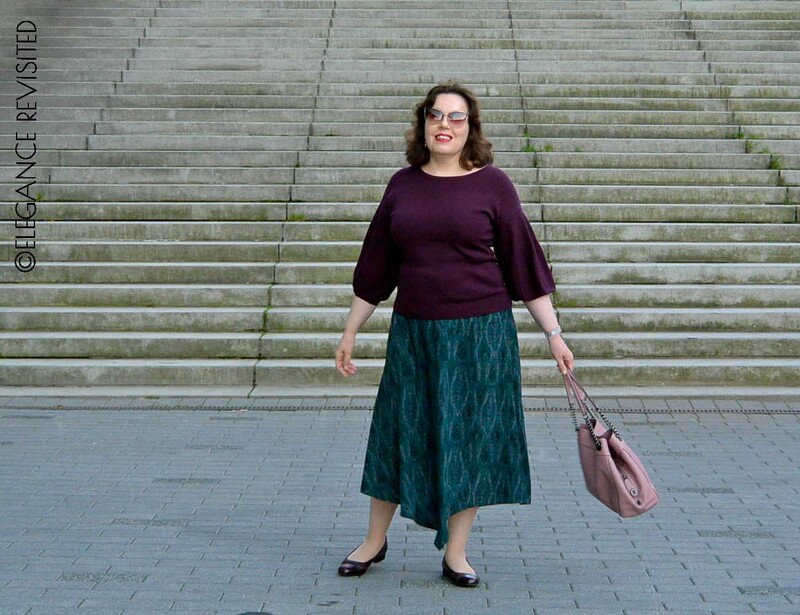 I like your outfit but I too have statement sleeves on two Summer blouses I’m planning to shorten them for next year. I’m bored by them. I’m trying to comment again after being able to for so long…hopefully the issue has passed. I’m like you, I’m not normally one for asymmetrical anything. I feel like something always looks off. Although I adore statement sleeves I found the same issues you mentioned here…none of my coat sleeves are large enough to accommodate them. I’m in love with the deep rich jewel tones of these two pieces together. It looks so good on you! I think it should be easier to comment now that I had the blog migrated to WordPress. Lovely color combo and lovely asymmetrical skirt too, the print is so beautiful!. 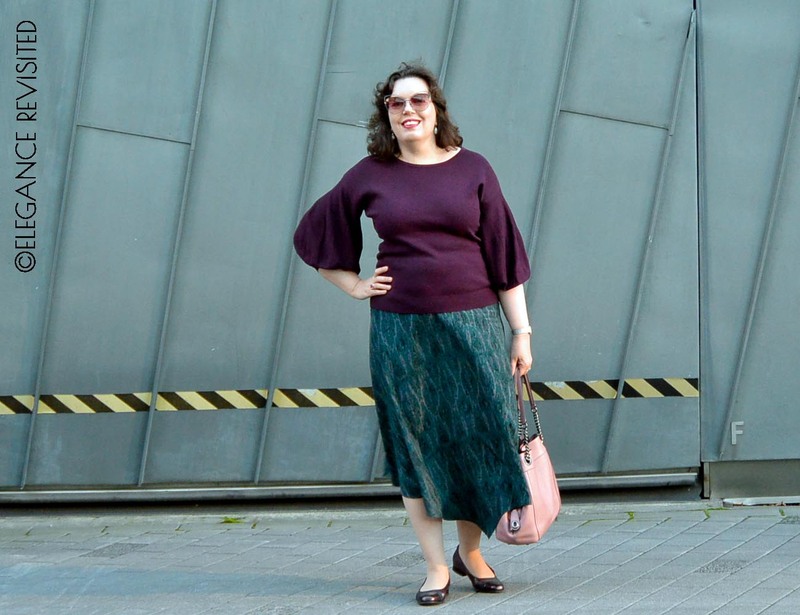 I like statement sleeves, even if sometimes make my life harder, as I’m really clumsy (door handles are evil!). Having to accomodate big sleeves into a coat is something that disuades me from wearing them (but not always), so I keep them only for warm weather! Thank you! I’m into darker colour schemes now, for winter. I’m incredibly clumsy, too, and tend to avoid clothes that can get caught somewhere. And I’m beginning to think that the only thing that can accommodate statement sleeves is a poncho (and it’s way too cold for that now). The only statement sleeve shirt I have, there is elastic, so I can push them up. I adore this combination of colors, oh, that I could find the skirt in the states. Oh yes, elastic is necessary. There’s nothing worse than sleeves that prevent natural movement. Thanks! 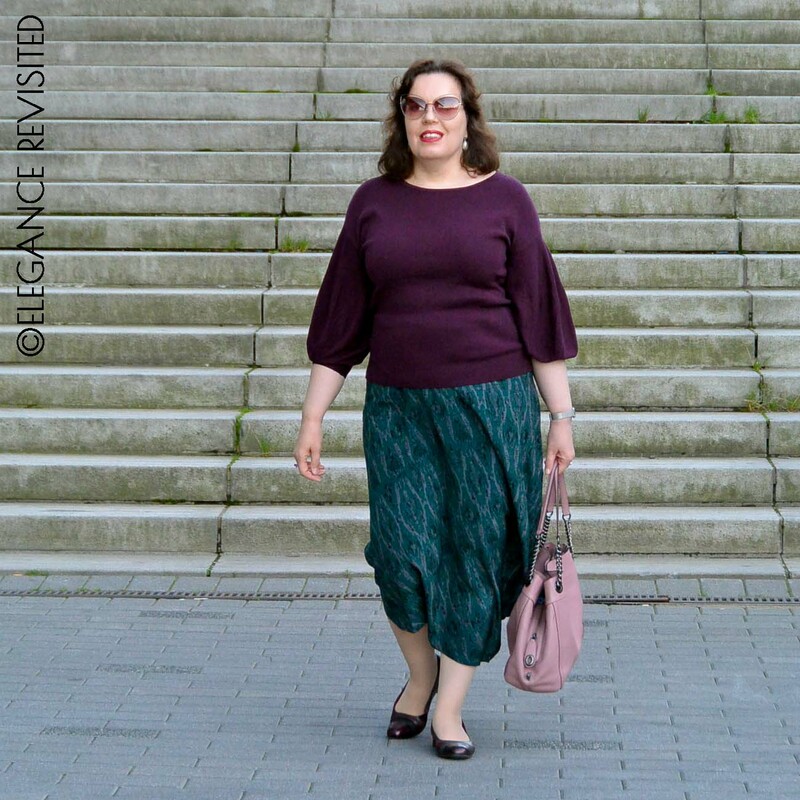 Love the colour combo of the top and skirt together! I really like the statement sleeve trend, but like you I don’t find it the most practical! I have oen dress with the most fun sleeves, but they are always getting caught on things when I wear it so I haven’t worn it much to be honest! Ha ha, I’m in full agreement with your annoyance with statement sleeves! They get caught on stuff, like cabinet door pulls and the cat’s feet, they’re bunchy under cardigan or coat sleeves, and they’re so distinctive that you can’t wear them that often cuz everyone notices them! “Didn’t you just wear that big sleeve shirt yesterday? And Monday? And last week? ?” Versus a plain blue blouse or white tee, no one notices and you can get away with wearing it almost every day! Aww, well it’s nice to always have one or two “special” things in addition to the classic pieces. I really like both of these pieces Tiina, sometimes its good to leave our comfort zones. I always like a statement sleeve but mainly for Summer , so no coat problem and not hideously long , I need to use my hands. The colours are also very you. Thanks, Jill. yes, statement sleeves are strictly for summer, or early autumn. I love both the skirt and the top. I do like statement sleeves but I agree that they can be problematic. The shorter puffy sleeves are better for when you don’t need a coat, while long sleeves with a flare cuff can work with a jacket as they can poke out of the jacket sleeves. A sleeveless cardigan or trench coat is another option. Thanks for linking up! Thanks, Emma. I can’t wear long sleeves under a jacket, that’s just way too much layering for me. I’d need one of those big wrap-around coats with really wide sleeves. That’s the only thing I could imagine wearing over any sort of statement sleeves.